Here are my comments on the Ep. 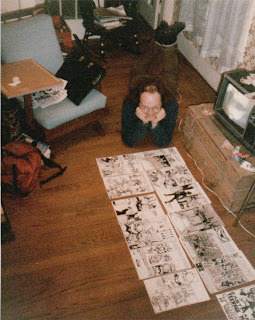 94 "final" draft. Karai, holding the sword (now wrapped in fabric) and the helmet, slowly and ceremonially walking down a grand staircase. But this, this may be the hardest cut of all…"
I think it would work better if Leo says "as many times as I must" instead of "as many times as they want". Once, she had a goodness in her … once, she had honor. **ON- A display case, Leonardo <LEAPS> from B.G. onto it. He crouches down ninja style ready for action. His eyes narrow. But now, she has so far crossed the line that there is no turning back." "Once, I thought there was good in her... I thought she had honor. I was wrong." And I would eliminate the second line (because it is superfluous) and go right into "From what she did to my family I will have justice." (Note that I have gotten rid of the "me and mine" -- I think it's clunky. And if we make that change, then maybe Leo's next line should read "I will avenge them..." instead of "I will avenge my family..." so we don't repeat the word "family" twice in two consecutive lines. "**With a huge <CRASH> the one Shrednaught <BREAKS> through the wall. Falling bricks tumble to the ground, dust fills the air. I thought the Shrednaught was "silently buried under a camouflaging pile of rubble and debris"? What's it doing crashing through "the wall"? "**WIDER – The whole Shrednaught goes limp and slumping now that Leo has “knocked out” the pilot. Leonardo looks at the Foot Ninja/Pilot’s “Foot” uniform. "ON- The Foot Ninja (partially inside the Shrednaught). *He presses a button on his controls. Lights <FLASH> on the suit and a <HIGH PITCH NOISE> grows louder and louder. Leonardo does a backwards <ROLL> away from the Shredaught. Leonardo DIVES out of the lair, and into the sewer tunnel as fire <EXPLOSION> shoots from the doorway behind him, just as he lands to safety." This "self-destruct suicide" move by the Foot ninja doesn't make a whole lot of sense. I mean, Leo didn't DISABLE all of the Shrednaught's weapons and combat systems -- he just found a way to "pop the lid" and bapped the Foot ninja piloting it. The pilot SHOULD have all of the Shrednaught's weapons at his disposal... so why does he commit suicide instead of trying to fight more or at least escape? Leonardo. Deploy all available Foot Ninja. Search the city. Destroy him! I want Leonardo’s head on my desk before sunrise! **The P.P. Foot Ninja bows and turns away. Karai turns to the night skyline of the city. This night, my beloved father will be fully revenged." I think the "I want Leonardo’s head on my desk before sunrise!" is kind of silly and unnecessary -- I'd lose it. Also, I think the word should be "avenged", not "revenged" (which I'm not even sure IS a word). 7.) There is some SLIGHT improvement in the way Leo finds the others, specifically how he finds Raph, but it isn't enough. There is still no indication or explanation of HOW he finds Don, Splinter, and Mike, WHY he looks in the places they are hiding. He just DOES it. It's probably too late to fix this silliness completely, but maybe a line from Leo to Splinter like "I'm glad I paid close attention when you were teaching us those ninja tracking lessons, Master" would help.
" It just occurred to me that it would have made a lot of sense for the Turtles to have had a contingency plan for an event of this nature -- some catastrophic thing happening which would split them all up. They would very likely have had one or more pre-set locations where they could rendezvous in an emergency, so they wouldn't have to waste a lot of time with random searches." And, with my family safe, I finally can rest easy." I think Splinter would use the more grammatically correct "rest easily" rather than the more vernacular "rest easy". "Leonardo walks and pulls the blanket around Splinter wrapping him inside. " What an odd sentence! What, exactly, is meant by this? "Splinter smiles patting Leonardo on the side of the arm." Another odd sentence. Why "the side of the arm" instead of simply "the arm"? It means, nothing is permanent, but for now, let us focus on the present moment. How are you, my son? I wish I had been here to help you … but the experience with the Ancient One … it was pretty amazing. Yes, I can see it in your eyes. I have my son back." It means nothing is permanent. But now, I wish to know -- how went your journey? It was... difficult, yet rewarding. And my experience with the Ancient One … it was pretty amazing. And, I can see something else in your eyes. Your journey is not finished." I would lose the "Your journey is not finished." bit, as Leo's going after Karai is NOT part of the journey we set him on, and I don't think it's a good idea to make it so. It's also a superfluous line. I’m going to go get some food, and some supplies and medicine. I’ll be back. WIDER ON- The room as Leonardo exits. And a big flat screen TV. And some pizza, and Chinese food, oh, and some gyros…"
Compared with Mike's and Raph's requests, which are sort of reasonable, Don's request is SO stupid that I think we should just drop it. Remember, just because Raph and Mike want Leo to bring them back something doesn't mean that Don has to. So, you’re the new Shredder… I’m not impressed. *Karai <UNSHEATHES> the sword in one fluid motion. You will be! When I cut you to pieces! You will not live to see the dawn!" Yes... and I am your doom." You’ve gone too far this time, Karai. And, I am not finished! Only when I have destroyed you, then I will have truly avenged and honored my father." Not far enough -- only when I have destroyed you, then I will have truly avenged and honored my father." Everything you honor is a lie, Karai. That sword in your hand, that helmet you carry, and especially the man you call father." Everything you honor is a lie, Karai. That sword in your hand, that helmet you carry, and especially the man -- the thing -- you call 'father'." You are trying to build an empire on a foundation of lies and evil… You are destined to follow in your father’s failure. How dare you even mention my father!" My father only failed to destroy you. And I shall not repeat that mistake!" Your technique has changed? Your form is strong." 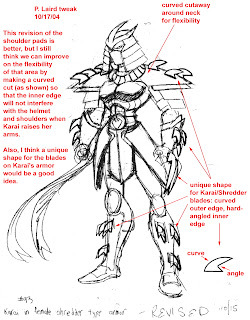 "*Karai PICKS UP her Shredder helmet placing it on. You are not only facing me. *CLOSE ON- The burning red eyes of the Shredder helmet. You are facing the Shredder! Really? Must be a little crowded in that helmet." This is truly "groan worthy" dialogue. I would lose all of it. I thought you understood honor. But I was wrong. You’re exactly like your old man… You understand nothing." Leo's use of "your old man" is inappropriate for the moment. I would substitute "him". 21.) I still don't like the ridiculous ease with which Karai takes BOTH of Leo's swords away from him with a CHAIN. And it seems to be done not for any great reason, but just so Leo can say "I don’t need weapons to defeat you Karai… Your own anger defeats you…" -- and then, four lines later, he goes and grabs a weapon (one of his swords)! I guess maybe he DOES need weapons. You’re losing to your anger Karai… You remind me of a turtle I know…"
Who is referring to here? Raph? Or himself? If he's referring to himself as he used to be BAO (Before Ancient One), then shouldn't he say "You remind me of a turtle I used to know…"? What’s the matter, Karai? Can’t handle me on your own? Need back up? That’s a first." More inappropriate "tough guy" lines from Leo. And Karai needing backup is DEFINITELY not a first, so that line is goofy. The next time we meet, I won’t spare your life." I'm granting you a last chance to do the right thing, Karai. Don't waste it." I would also leave out Karai calling for backup -- in fact, she could whip out her com device to TRY to do that, but Leo could make some kind of cool move and take it away from her. Hey, thanks Leo! What’s up with the arm? Just a little battle damage, Mikey." Here are my comments on the Revised Ep. 97 outline. I'll be frank up front so we don't waste a lot of time -- I really, REALLY don't like this outline. "CUT TO the prison as the super villains are delivered and attack the guards. Malignus reveals himself and his plan to destroy the Justice Force with the help of a little alien goo (This was the last piece of the puzzle that he needed for revenge. We will destroy the Justice Force). With it he’s going to get the heroes out of the Fortress of Justice so that they can get in there, and tap into the defense system. He’s going to beat them with their own weapons. " I hope this makes more sense later on, because at this point it a big mess. "the super villains are delivered " -- what super villains? "Malignus reveals himself and his plan to destroy the Justice Force with the help of a little alien goo" -- from where? What does alien goo have to do with these super villains and this prison at this moment? "Inside Mikey is spazzing out over the cool super hero conference table and chairs, the computer monitoring system, the food replicator (makes himself a Super Hero sandwich) and the costume replicator (He makes about eight Turtle Titan costumes for a rainy day. “Okay, I think that’s enough, Mikey.”) "
Is this STAR TREK? "Replicators"? I think we should steer clear of that kind of ultra-high technology, and if we want to do some of this goofy Mikey slapstick, maybe we can have some kind of "automated sandwich (and/or costume) maker" -- a kind of sophisticated computer-controlled machine which -- for example -- can take an order for a ham sandwich, and can cut the ham, slice the bread, assemble the sandwich, squirt mustard on it, and deliver it on a plate. I also think eight costumes is a bit too much, even for this gag. "The heroes arrive at the prison and engage the monster but it’s a fake and a trap. The super villains attack the heroes and it’s almost like they’re trying to get the heroes to use all their powers against them. At one point, the super heroes all absorbed by Gas Giant. The turtles turn the tide of the battle but as they defeat the villains, the villains turn into goo. Meanwhile, the heroes are apparently walking into the Fortress of Justice … leading the way for Malignus and the real super villains."" My head is spinning from trying to make sense of all of this. There is so much silliness and illogic in this scenario that I don't know where to begin. I think part of the problem here might be the attempt to connect Malignus and the super villains with the "alien" goo, and it's just not working for me. "Inside, Malignus gloats that his victory is at hand as he drains more of the trapped heroes powers"
And he does this HOW? "But, Ananda manages to send one of her Domeoids with a “Princess Lea-esque” message: “Help us Turtle Titan, you are our only hope.”"
"The turtles have to get inside and destroy the main mega computer’s core. The domeoid shows the turtles a “backdoor” into the Fortress through the sewers." Well, isn't THAT convenient? What a great security system the Justice Force have! "The Turtle Titan starts popping up everywhere (“I’m over here!” “No, I’m over here!” And the various “Turtle Titans” with their “super speed” and seeming “teleportation power” draw the villains away from the computer’s core allowing Donatello (also a Turtle Titan) a chance to slip in with the domeoid." I am speechless. This is TOTALLY inane. 8.) I strongly suggest that we either (a) trash this outline and start from scratch, or (b) forget this story idea. Here are my comments on the Ep. 102 premise. "Casey and April are about to go out on a date. April’s all dolled up in a trendy biker outfit, expecting a romantic motorcycle ride to be Casey’s style. Casey, on the other hand, shows up in a sharp looking suit and his hair pulled back (Steven Seagal style) betting April will be looking forward to a fancy dinner at a 5 star restaurant. A simple misunderstanding, but an awkward one. As they argue about what the date is supposed to be, April pulls Casey close. " Let's keep the "arguing" to a minimum, please. As I have said before, I think it's tired April/Casey shtick. And I think perhaps to emphasize the difference in their ideas about what each other wanted out of this date (shades of O. Henry! ), April should not be "all dolled up in a trendy biker outfit", but rather in some kind of more rough-hewn casual outfit -- ripped jeans, scuffed leather jacket, etc..
"It’s Leo, Mikey, and Raph; with a very sickly Donatello in tow. They need to run off and deal with a pressing mutant threat, but Don is too sick to go, and the brothers need someone to look after him." There's something about this that bugs me. Does it really make sense that the other three Turtles would lug an obviously sick Don all the way from their new lair to April's apartment (a) on the off-chance that she would BE there, and (b) she would want to babysit a sick mutant turtle? Wouldn't Splinter, back in the new lair, be at least as capable of taking care of Don, and wouldn't Don be better off there, in the comfort of his home surroundings? One way to make this work would be to establish that the Turtles were out on some mission in the city, and DURING that mission Don started to feel very poorly, and rather than go all the way back to the lair, HE suggests that they might try to see if April is home and if he can crash there for a while. And if we did it that way, I think we should NOT have him be feeling TOO sick at that moment -- just enough so that he feels he needs to chill out. Another idea would be to have him stay at the lair and the Turtles interrupt Casey and April's big kiss scene with a Shell Cell call, asking them to come and sit with him. (Although if Splinter were there, would that be necessary?) It seems the writer wants to have a big fight scene in the antique shop, and if that is key to this episode, I guess we should keep it set there. But maybe it isn't. "As they settle the sickly brainiac on the couch, Leo fills April in on why they have too rush off; they have to “clean up” any mess this newest outbreak causes before the epidemic gets completely out of control." Let's make it clear that the Turtles don't think they can do it ALL -- it's way too big a job for just them -- but they are trying to do their part, the part they are best at (kickbutt ninja monster squishing action), and the city (police, firefighters, etc.) can do the rest. "and maybe even bizarre mutant Turtles (can we do that?)" "April’s apartment sinks into complete darkness. Casey and April tell Don to sit tight; they are going downstairs to the antique store to get candles and flashlights, etc. " "Don starts to “hulk out”! We hear the tearing of cloth as his mask, arm pads and kneepads tear against his grotesquely expanding body." " Just then, a bulky shadowed figure (a few inches larger than Don) darts from behind the kitchen counter and out April’s door, nearly breaking it off its hinges. " I think that Don has to grow more than "a few inches" in order for his mask, arm pads and kneepads to tear off. "Then, April and Casey spot a frightful shadow against a wall. It is of a large “turtly” body. It’s morphing, becoming larger, contorting and twisting! Spikes (or some such) rise on its back." I very much want to use the design that Jim came up with for the mutated Raph in the Mirage TMNT comic, rather than some over-the-top number with lots of spikes and such.
" “Donny” again warns them to stay away, and then makes a dash for the store door and staggers downstairs (where Kirby used to live)." "April quickly rifles through some heaps of old machinery in the room to find stuff she can use for an S.O.S. Casey discovers an old car battery. She finds a beat up radio. Casey brings the old car battery back to life, and April rewires it to the radio to send a distress call to Leo’s ShellCell." This "super McGuyver-April" bit is really ridiculous. What is April doing with "heaps of old machinery" in her storage room? And it makes just as much, if not more, sense -- and probably helps to ratchet up the tension -- to have the other Turtles simply return at that moment. I mean, they WERE going to come back for Don anyway, right? "The only way out of this storage room now is the access tunnel to the sewer (great idea Mike)." Continuity question -- was the sewer access door in this old storage room? I know we introduced this concept in one of the last few scripts, but I don't remember it being in this room. "He tells Raph and Casey to go up top and pull the Green Bros van around"
Pull it around from WHERE???!! I don't recall anything to indicate that this truck was nearby. "Leo and Mikey stay down below, fighting and taunting the monster, "
Taunting? What is there to indicate that the monster that Don is now would even respond to taunts? And doesn't it seem a bit cruel for the other Turtles to TAUNT Don in his unfortunate state?
" The monster chases them and leaps into the back of the van after them. Leo and Mikey jump into the cab of the van and close it off from “Donny”, as Casey and Raph close the back doors to the van with a heavy chain. “Donny” is now trapped in the back of the van – thrashing and howling like a demon, but definitely trapped. " Two questions. First, has Don already tricked out this new van with gear that makes it their "mobile command center"? If so, it's sure to get trashed if they do this. And second, how tough is this van? If it hasn't been reinforced in some way, I would think it wouldn't take very long for Monster Don to bust out of it, even with the convenient "heavy chain". 14.) Actually, I really don't like this whole bit where they trap Don and bring him to the new lair. It's really kind of goofy (and how does Monster Don fit through all those manholes, anyway?) and as mentioned in point 13, there are some significant logic issues with "trapping" him in the van. I think something more clever is in order, and one thing to address is how they get Leatherhead to help them so easily and quickly. I think if we can work out some kind of way for the Turtles to render Monster Don unconscious, perhaps with some weapon that they might have been trying against the mutants, it would help make all this make sense. One thing that might help in working this out is the fact that (well, as far as I'm concerned, anyway) all of this action really doesn't have to happen at such a continuous breakneck pace. For example, it might make a LOT of sense for the Turtles to lose Monster Don in the sewers for a while, and they go back to the new lair and really work out a GOOD plan for finding, capturing, and holding him. This might be the time when they get hold of Leatherhead and enlist his aid -- not only would Leatherhead's great strength help them out, but he might also have some gizmos or weapons that would allow them to tranquilize Monster Don. Maybe he's actually been working on something that could be used to capture/pacify HIM when HE gets out of control. I found this photo while I was looking for some other images to go with a post on my other blog, and thought it was kind of nifty. I'm not sure who took it -- probably Kevin, though it is possible Jeannine was behind the camera. I'm not really sure what the point of it was. 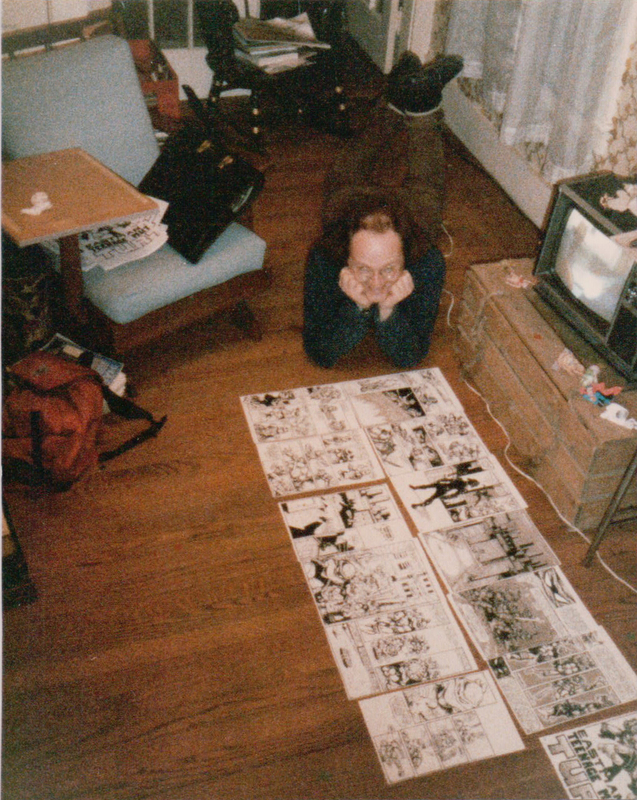 The artwork I am posing with is, as fans of the comics will surely recognize, some of the interior art from the first issue of TMNT. This was apparently taken midway through the process of toning the pages, as some are clearly completely untoned and others partially toned. Here are my comments on the Ep. 95 first draft. "WIDE – Both tables rise, bringing both Bishops side by side. The wires from both Bishops’ heads are converging in a central machine, a conduit for the transfer. " I think it is worth noting that we are establishing that Bishop and Stockman possess and are using a VERY powerful technology -- something which allows the transfer of consciousness from one body to another. This is no small feat, and could have large repercussions later on. I bring it up to raise this question -- is it too much? Or should we have Bishop's consciousness be transferred to his clone bodies by an actual, physical brain transplant? Hopefully some decent parts for motion detectors will comes our way. I’d like to get the reservoir secure sooner than later." Two things here. FIrst, I think it should be "come" and not "comes". And it seems a bit odd for Don to refer to their new digs as "the reservoir", not least because unless I am mistaken, they are not staying in the reservoir but in the pump house. I would replace "the reservoir" with "the new lair". I’ll bet he did. Harry would say he saw a giant crocodile down there if it’d get him off nights." I’ll bet he did. Harry would say he saw a giant crocodile or one of them giant turtles down there if it’d get him off nights." "CLOSE ON THE CABLE BUNDLE – as the worker examines it. Something has CHEWED THROUGH them. ON THE WORKER – confused. That’s weird… it looks like something chewed through these. POV – from further down the tunnel, something is watching the worker as he examines the cables. The POV looks strange, the edges of the frame blurred and ultra wide angled, like a fish eye lens. Hey, you should come check this out! It’s bizarre!" ON THE WORKER – pissed off. Carl? Get down here, and bring the [insert appropriate repair hardware/equipment here] with you." Come on… I want to make one more stop up top… there’s a junkyard where I’ve found some good stuff before. We can take the sub sewers – we should avoid the Foot down there." The "sub sewers" bit threw me -- for a moment I thought he was talking about routes that they used the Shell Sub in. I would delete this line -- "We can take the sub sewers – we should avoid the Foot down there" -- for that reason and the fact that it's really kind of superfluous. VERY minor point, i.e. the misspelling of "establish". But it occurs to me that you could split that intriguing word "estrablish" in half and come up with a cool name for a character: "Estra Blish". 7.) I may be missing something, but -- how is it that Stockman can make a great, working body for Bishop, but he CAN'T do it for himself? I’m gonna have to get back to you on that!" "HIGH ANGLE – the tendril hits the tunnel ledge. It sits for a half second, then little MINI-TENDRILS grow out of it, and the severed limb skitters away. WIDE ON THE TICKS, who begin <SHRIEKING> as well. The remaining Earwig (2) LEAPS at Leo, but Don KNOCKS it back with his bo staff in a powerful blow. ON THE EARWIG (2) – as it <SMACKS> up against the tunnel wall. It begins to DISSOLVE, ooze coming from every joint, finally falling to the ground as it disintegrates." Logic question: Why is it that the cut-off tendril grows "legs" and runs away, but the earwig disintegrates? Doesn't seem to make sense. It’s intelligent… bugs, fish, that rat… now a human…"
This line doesn't work for me. I think we need something to indicate that this is a NEW and more horrible variation on what they have seen so far -- a MERGING of different species into one, now including human life as well as animal and insect. And Don's comment that "It's intelligent" may be true, but for all we -- and he -- know, even though they don't SPEAK, the other mutated forms may ALSO be intelligent. The mutagen is… it seems to be moving up the food chain – it’s as if the DNA itself is intelligent… "
"Mutagen" is a great word, but because it has already been so tied in with the ooze that transformed the Turtles, I suggest that we find another word to use here, so as not to engender confusion. The initial outbreak… perhaps. I need to study one of the creatures… find out how it spread. If it spreads by contact… well, it’s truly fascinating. And if it IS spread by contact? I hope we are not painting ourselves into a conceptual corner here. I know that we have plans to make Don change, from the wound he receives from one of the creatures. But if we DO establish that mere CONTACT can initiate mutation, then ALL of the Turtles should change. 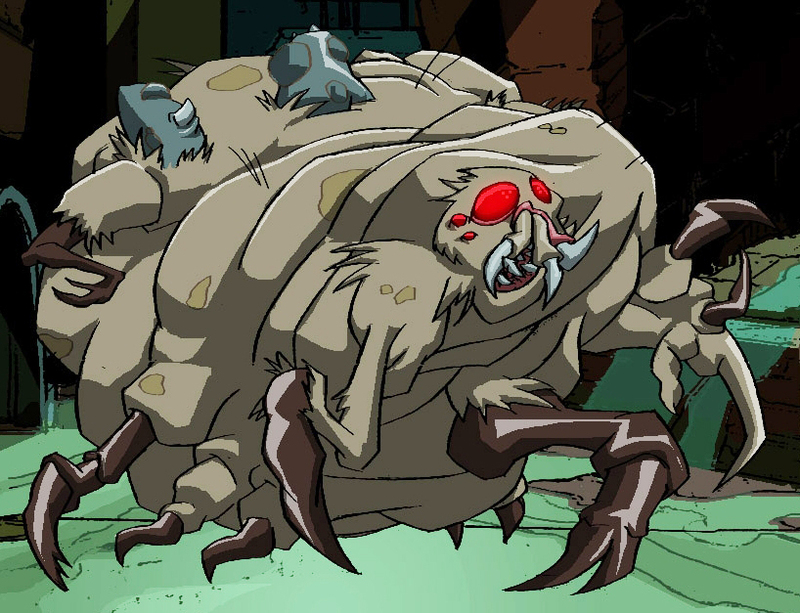 IN fact, given all of the physical contact they are having with these mutants and the VERY likely chance that they ALL have gotten at LEAST slightly scratched during these fierce battles, then they should ALL mutate. Which we don't want, so I think we need to come up with a good "mutation vector" analysis. Also, we need a reason why Don doesn't turn into a mutant monster right away (as the cable guy did), and here's a possible explanation -- the Utrom mutagen in his body acted as a retarding agent to the effects of this "alien" goop. "ANGLE ON THE ROACH, who goes skidding back across the sewer floor. Half of the roach begins dissolving like a wax statue, the other half remaining in tact. Its legs slip and slide as it rights itself, then skitters away down a tunnel." I feel like we're losing it here. These may be fun visuals, but why does one half dissolve and the other run away? Makes no logical sense that I can see. "CAMERA PANS DOWN TO DON’S BANDAGE. A small stream of alien OOZE is seeping out from under the bandage." I think we're "gilding the lily" here with the "stream of alien ooze" seeping out from under his bandage. It's too much, and crudely telegraphs what is to come. Here are my comments on the Ep. 96 first draft. "PUSH IN SLOWLY on the O’Neil Family Portrait (NOTE: NEW VERSION includes April’s older sister) hanging on the wall of the shop. " Because this family portrait is a "new version", let's make it an all-new photo, with new poses, so it doesn't look like we've retroactively changed to original family photo from "April's Artifact". This one could be more of a candid instead of a posed studio portrait. One of my pet peeves -- there is no such word as "alright". And it's used a lot in this script. Grrr.... that's not all right. Are you alright, April? You seem quieter than usual. I’m alright. It’s just been a tough few months. All my friends used to be around – now I barely get to see them." In addition to being bad form, the use of "alright" twice in the space of three lines is way too much. At least one of these instances should be replaced with "okay" or "fine" or some such. Is this about those guys that you’re always talking about? " This is a curious line. It implies that April talks to her sister about the Turtles a lot, even if she doesn't reveal that they are mutant turtle ninjas. Does this make any sense? It's also curious that there is no follow-up to this line -- April just ignores it! You used to talk about that Casey guy a lot. Is he your boyfriend? You still seeing him? Sorry, didn’t mean to pry." I don't get why April doesn't want to talk about Casey. In fact, I don't get most of this conversation, which is really overly stiff and morose. I would think that at the very least, April would be jazzed to see her sister, even if she is bummed that she hasn't seen the Turtles a lot recently. "CLOSE ON APRIL’S FACE – staring at the computer monitor. PUSH IN ON THE MONITOR – with more numbers and symbols. This is no virus. " I know April is really bright and all, but it seems a pretty big leap for her to say "This is no virus" after a few seconds of looking at the screen. Maybe instead she should say something like "This is no virus... at least not one I've ever seen before." "ESTABLISHING SHOT. Michelangelo sits on a cushion – watching television and struggling to reach the last chip out of a can of Pringles. PAN ACROSS TO – Donatello, wearing his work goggles, working on something on his table in front of the big “Green Brothers” moving van." Uh... did I miss something? 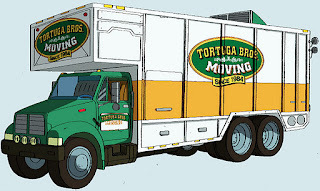 Where and when did the Turtles get this "big “Green Brothers” moving van"? Where’s all your equipment, Don? I moved most of it into the moving van. Figure it can be our new mobile command unit. I’ll move the rest of my equipment in there after I fix the Battle Shell that Raph wrecked." This exchange seems like a painfully clunky way to establish that Don is tricking out this moving van (and where did that come from again?) as a mobile command center, and also really doesn't make any sense. Why would Don move ALL of his equipment into the van? Is he planning to spend most of his time in the van and not in the lair? We have reports - and these are being confirmed - that a mutant fish attacked an apartment complex by coming out through the toilet bowl." We have reports that a mutant fish attacked the residents of an East Side apartment by coming out through the toilet bowl." Another mutant from the outbreak. Come on, Raph. We better go check it out." Minor grammar point -- I think Leo should/would say "We'd better..."
11.) There is perhaps a logic problem with the fact that while April's computer is "going haywire" (to use her words), she can still use it to send email to Don. Perhaps we should establish that she CAN'T do that, and in fact is using ANOTHER computer (a laptop) to send Don the email. "Donatello’s screen starts to display the symbols and gibberish from April’s computer. PREVIOUS – Donatello’s eyes narrow as he stares at the screen. It looks like static or gibberish, but it’s coded in a repeating pattern. " Here's a question -- are these symbols similar to the ones the Turtles became familiar with during their "April's Artifact" adventure? If so, perhaps Don could refer to that here, even if it's just something like "Hmm... there's something familiar about these symbols." Uncle Augie is in trouble!" Well -- DUH!!! I don't know why, exactly, but this line from April seems to be really dumb in the "stating the incredibly obvious" vein. I really don't think we need it -- a close up on April's concerned face might be all we need here. Robyn sits on the couch watching television. April sneaks out the front door. April walks in and joins Donatello at the counter. Donatello holds his work bag and stares at his Tech Tab. " The bit with April sneaking out of the apartment and leaving Robyn watching TV made me scratch my head a little, as it seemed completely pointless. Then I realized that the writer was trying to let us set up a scenario that would allow April and Don to work uninterrupted in the antique shop. I think it could be done better with just a line of two of dialogue between April and Don, something like Don asks April where her sister is and April says something like "Oh, she's jetlagged from her trip -- she'll be sleeping 'til tomorrow" or "She's glued to the couch watching (her favorite TV show or movie)". The message must have come through your dimensional artifact and jammed into the nearest computer. " The message must have come through your dimensional artifact and been received by the nearest computer." The message must have come through your dimensional artifact and been received by the nearest WI-FI-equipped computer." "ON APRIL – as she goes behind the counter and pulls out a box. Then I’m using those coordinates to go save Uncle Augie. CLOSE ON THE BOX – as April sets the box on the counter and then opens the box, revealing the dimensional transport artifact." I appreciate that April loves her Uncle Augie and wants to help him, but the way she is approaching it is really dopey. Basically, she's going into an unknown situation and environment with ZERO preparation. She doesn't take any supplies, food, weapons, etc.. Lame. April, the message might be fake or wrong." I'm glad this line is in here, though I think it could be expanded upon a bit -- especially the part about being "wrong" -- i.e. incomplete. "ON APRIL AND DONATELLO – as the glowing grows and <SWOOSHES> over April and Donatello. They disappear – leaving the artifact behind to fall on the ground." My memory of how it worked in "April's Artifact" may be a little shaky -- but if the artifact doesn't go WITH you when you use it, and Don knows this (or at least he SHOULD), aren't they taking a HUGE leap of faith that they will find another artifact which can send them back home? And the more I think on it, the more ridiculous it seems that the artifact doesn't go with you when you use it -- that's a pretty poorly-engineered interdimensional travel device! April, I’m not letting you go alone on something like this. We’re in this together. " Something about this bugged me, and after a while I realized what is was -- and that was the fact that Don doesn't even suggest that they get one or more of the other Turtles to go with them. I think we need to do something to establish that both April and Don think there isn't time enough to get the other guys together to go on this mission. You have nothing to fear here. We are the Brotherhood and we have built our civilization on the advancements of Peace and Love and Brotherhood. ON DONATELLO AND APRIL – following behind. That’s good. Cause I’d hate to see you guys angry and full of hate." Don's line is sort of funny, but it is really more of a Mikey line. I think it's also unnecessary (as in obvious), and we should lose it. 21.) If the big Transport Artifact isn't actually BROKEN -- Augie just doesn't have the coordinates for Earth -- why don't the lizard guys have him transport them to some OTHER world to plunder? Is Earth the ONLY destination they're interested in? If so, why? I am sorry, but this is the central food storage for our entire civilization. It is a restricted area." This line cracked me up. Must be a pretty small civilization if their central food storage can be contained in one building. "HIGH ANGLE ON THE DOUBLE DOORWAY – as the four Brotherhood warriors stand guard. Donatello climbs upside-down on the ceiling past them." Let's keep in mind here that Don is a mutant turtle -- NOT Spider-Man. "WIDE ON SEVERAL WOODEN BARRIERS – blocking the path of the railway. The word FORBIDDEN is crudely written on the barriers. The out-of-control monorail car RACES INTO FRAME – and <SHATTERS> the barriers into pieces. WIDE ON THE MONORAIL CAR – as it sails through the barriers and down a steep decline on the railway. ON THE END OF THE MONORAIL TRACK. A rubber safety barrier marks the end of the line – the out-of-control monorail car RACES INTO FRAME and <COLLIDES> with the safety barrier, sending the monorail car hurtling through the air. WIDE ON THE GROUND – as the monorail car <CRASH LANDS> and skids to a stop. CLOSE ON THE MONORAIL CAR – as Uncle Augie, April, and Donatello gingerly climb out. At least we stuck the landing. " This whole action sequence is more than a little bit preposterous (why is there a "steep decline" near the end of the railway?) and the violence with which the car leaves the track, flies through the air, and crash-lands makes it seem unlikely that our heroes would just climb out "gingerly" but apparently uninjured. The Brotherhood call this place the “Bone Yard”. They never come in here. We should be safe." Uh-huh. And Uncle Augie knows this, and has no suspicions about the Brotherhood? What a dimwit. I should’ve seen that the Brotherhood was evil. But bringing Peace and Love to Earth… Cures for diseases… It all seemed so beautiful. " So far, we've not seen Uncle Augie say or do ANYTHING that would lend credence to his claim that "I should’ve seen that the Brotherhood was evil". I think this bit needs to be rewritten to show that he WAS completely fooled by them, and that his regret now is because of that, and that the main reason he was fooled is that he was blinded by the possibility that he could bring all these wonderful things to Earth. To prevent them from traveling to other dimensions, we have destroyed the book of coordinates. That should trap them here on our world." HAHAHAHAHAHAHAHA!!! Sorry... but... "the book of coordinates"? In this hyper-evolved super-technological world? I am suddenly reminded of one of the absolute WORST moments ever in a STAR TREK film, when Uhura drags out a bunch of old, printed-on-paper BOOKS to find the right Klingon phrases in an emergency. Maybe we should just have them say "We purged all other-dimensional coordinate files from our databases" or something like that. "ON APRIL – as she runs at the corner of the wall, then uses her legs to run up the wall (Jackie Chan move – see Rush Hour)." Oh. My. God. Please... somebody delete this incredibly ludicrous bit. "WIDER ON THE CITY STREETS – as holographic images of Zodats appear on the streets. " This is a clever gag to confuse and frighten the Brotherhood. The problem is there is no decent setup for it. I think the simple solution is that back in the scene where Don access the display and we get the recent history of the Zodats, we actually have a seemingly computer-generated holographic Zodat appear standing next to the display, telling the story. That way, we at least establish that these systems are capable of projecting 3D holographic images of Zodats on the streets, so it doesn't look quite so much like Don pulling this amazing feat out of nowhere. Here are my comments on the Ep. 98 outline. 1.) Bishop seems to be very passive with Stockman in this episode, putting up with his tirades without comment. I think that is out of character for Bishop. "We see Stockman in his lab with a soldering mask on. He’s soldering something that seems to be right in his lap. Sparks are flying." A minor point, but -- I don't think there is such a thing as a "soldering mask", and soldering doesn't throw off sparks. I think what the writer means is a WELDING mask. "Stockman gets up to try out his new leg. It works like a charm. But then, his other leg falls off." I think here we've crossed over into "stupid". "Stockman is at the lab, clutching his head in agony. He’s never looked worse: his decomposing flesh is stitched together with metal staples and green waste oozes from open sores. The twisted metal of makeshift limbs jet out from empty arm sockets." I'll reserve final judgment until I get to the end of this outline, but with this description of Stockman's condition, I think we are getting into really silly territory. I mean, as egotistical as Stockman is, don't you think he would go back to his "brain in a jar" setup if his new body had deteriorated to this point? That way he could start form scratch instead of stumbling around in this rotting monstrosity. "Stockman: “That’s when I met my problem! The reason for all of this! I know who to blame! And they’ll pay! They’ll pay with their life!”"
I think he means to say that they will pay with their LIVES. "Suddenly there’s a loud, desperate banging noise in the lair—the Turtles are surprised—someone’s planning on coming in through the secret entrance! But who?! They’re not expecting any visitors! But the noise is getting louder and louder. More and more desperate. The Turtles ready themselves for anything. Then, Casey bursts through the door. He’s been beaten up. Badly." Where exactly is this "secret entrance"? Above ground? Underground? I think we really need to get to work designing this new "hiding in plain sight" lair. "Stockman has got April flung over his shoulder and is navigating through the back allies of New York. " I think it's "alleys", not "allies", but anyway -- where is Stockman going? Back to the helicopter so he can return to the Area 51 base to perform this operation, it would seem. So... where did he land the helicopter? How far away is it? … but Stockman overwhelms her and is again about to begin the new body transference with a piece of his cyborg-ness (the laser torch and some sharp surgery-ish tools). " I think we need to be clear on the difference between being mad/insane and being STUPID. Stockman is the former, but not the latter. He CAN'T be, if -- for example -- he is capable of building himself this cyborg monster body. And I don't think he would be stupid enough to try to start the operation on April in these circumstances, without all the key support technologies to ensure that April's body (not to mention his brain) doesn't die during the operation. And it's not even necessary for this scene -- it's scary enough that he's still trying to get her. "But, the Turtles are coming up the cable trying to get to the gondola car now hanging high over the East River. Using their ninjitsu skills of balance and acrobatics, they manage to get along the cable almost running (flipping and somersaulting in a very precise and dangerous high-wire act)." 10.) Casey seems to disappear after he and the Turtles confront Stockman in the alley. Where'd he go? I went back and checked and indeed there was a later "Revised Final Draft" of Ep. 93 which does indeed have flying Shrednaughts. I still don't think they should fly, and I have to say I am a little concerned that a substantial and unexpected change like this can find its way into a "final" draft. I guess I should start paying more attention to these "finals". Here are my comments on Ep. 94 second draft. 1.) Although it is now somewhat improved, I'm still not loving the "Leo vs. two Shrednaughts" bit. I will say again that I do not want Leo to be "Super Leo" now -- he does have some new skills after his training with the Ancient One, but let's not forget that the important thing from his sojourn with the Ancient One was that his soul was healed. We just received a report… The two units stationed in the lair were destroyed. We found signs of damage from double katana. (PRON. “kah-tah-nah” all even in stress). CLOSE ON- A wicked smile comes to Karai’s face. Excellent. I can finally eliminate Leonardo… Deploy all available Foot Ninja. Leave no part of this city un-searched. I want him brought to me alive, if possible… not alive … just as good." 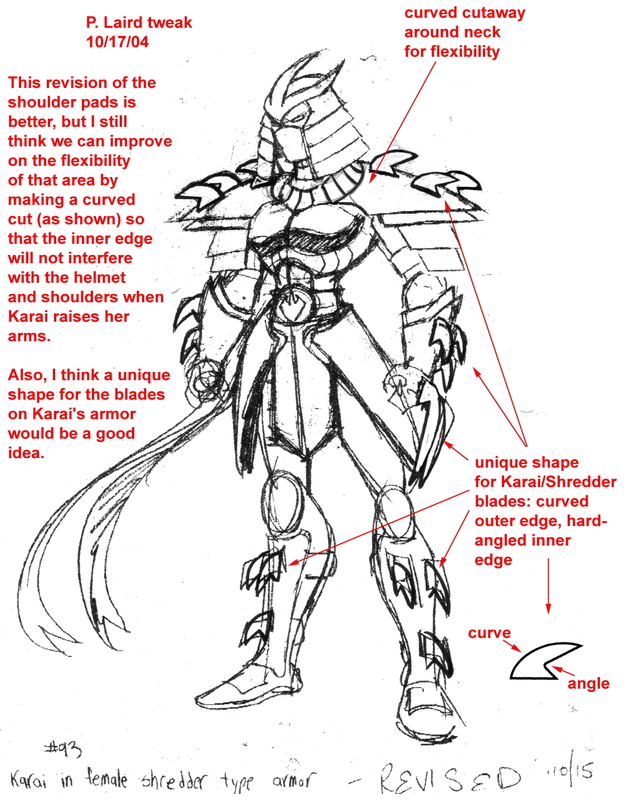 I get the feeling -- by the way she is described here (a "wicked smile") -- that if Karai had a handlebar mustache, she'd be twirling the ends of it. Why, when she just tried to wipe out the Turtles when she attacked the lair, does she now want Leo brought to her alive if possible? And why is the destruction of two Shrednaughts and their human pilots "excellent"? I would think she would be pissed that they were lost. And let's lose the "wicked smile" -- she should be DEAD SERIOUS. Who else in New York is gonna have a footprint like this besides a mutant turtle…"
"*ANGLE DOWN WIDE ON- Leonardo studies more motorcycle tracks, which curve and lead under elevated (subway) tracks. *LEONARDO’S POV- Above a train <SCREECHES> by. PUSH IN ON- Leonardo looks surprised. *LEONARDO’S POV- of Raphael’s helmet sitting on the ground. Leonardo <RUSHES> to the helmet, PICKING IT UP off the ground. Maybe the writer intended something different, but the way this is written it seems like Raph's helmet magically appears on the ground while Leo glances away. Otherwise, why didn't he see it the FIRST time he was looking down? "CLOSER- Leonardo <CROUCHES> ninja style as the three Foot Ninja <RUN> out of FRAME. CLOSE ON- Leonardo’s eyes shift and look. *LEONARDOS POV- Barely visible through overgrown vines, and greenery, is a door. *Leonardo <LEAPS> toward the door. He <STRUGGLES> to open the door, with a <CREAK> it opens. Leonardo looks across; the Foot Ninja are near. PAN DOWN TO- Leonardo crouches by the slightly cracked door as the shadows of a few Foot Ninja pass by. He then, securely <SHUTS> the door." I think it's a mistake to have this little "hide and seek" thing between Leo and the Foot Ninjas happen so close to the site of the Turtles' future lair, as if he disappears in its vicinity while being tailed, that's a red flag for the Foot. I think he should lose them earlier and then take refuge in the pump station. Also, Leo enters this place pretty easily... which makes me think that if it's that easy to get into, sitting in the middle of NYC it would be a favorite hangout for street people. Maybe we should make it harder to get into -- maybe Leo should find a subterranean entrance. "*The Turtle Tunneler (ep. 93) comes through the wall and into the sewer – LEAVING the FRAME. A moment later, the Shrednaught follows flying through the hole and into the sewer. CLOSE ON- The underside of the TurtleTunneler. A small square hatch is KICKED open REVEALING Michelangelo. He CRADDLES Klunk, <DIVING> and <ROLLING> away from the moving vehicle. CLOSE ON THE TURTLE TUNNELER– as a shot <BLASTS> the back wheel of the TurtleTunneler. The airborne Shrednaught <FIRES> again from its mini-cannon." What the -- ???!! A FLYING Shrednaught???!!! I don't think so. Time to bring them home … if we only had one …"
As it is clearly Leo's intention to make the pump station the new lair (recall his previous "This place … has potential" line), I think we should lose the "if we only had one" line. 8.) It's still curious how nothing Leo does really connects to HOW he finds the other Turtles and Splinter. He meditates, has visions of the others escaping from the lair, then says "Time to bring them home"... and just goes and gets them. How did he find them? Doesn't make much sense. And the more I think about it, the more this whole meditation/vision thing makes no sense. Other than possibly our saving some money by using clips from a previous episode, what does it accomplish for Leo to see how the others escaped the destruction of the lair? It doesn't show him where they ended up. I wonder if it might make more sense to use that time to show him using some advanced ninja tracking techniques to find his brothers. You’re gonna have to go through me to get to him!" Like Leo, Don does not say "gonna". 10.) Although it works for pacing purposes, doesn't it seem a BIT too coincidental that just seconds after Leo finds Don and Splinter in their hiding place, the Foot appear? Why now? Why this particular place? Maybe the attck should take place as Leo is leading them back to the pump station. An exhausted RAPHAEL sits in the sand propped up against a support beam (A band-aid stuck to his chin). He drinks soda out of a cup with a straw <EMPTY NOISE>." A band aid? Where'd he get that? Hey Raph, don’t worry, just think of it like this… Nothing is permanent. Life is a constant state of change, and we’re all gonna be OK."
Leo STILL doesn't say "gonna". Yes, I see. Your journey home is not complete… Be careful, son. She has progressed in her training." What exactly does Splinter hear in Leo's comment that makes him think that Leo is going after Karai? I don't see anything there. And if somehow Splinter DOES figure out that Leo is going into the lion's den to confront a deadly foe, why does he SMILE? What's there to SMILE about? "Karai <FLINGS> one end of the weapon toward Leonardo. The sword flies across the library hitting the ground with a slide. Karai <CROUCHES> and <SPINS> <FLINGING> the weapon once again toward Leonardo. Horizontal BG Pan as a <CUT> moves across frame. Leonardo <STAGGERS> back gripping his arm in pain. Karai <LAUGHING> <WHIPS> the chain toward Leonardo. The chain enters frame <YANKING> away Leonardo’s other sword." It seems somewhat preposterous that this chain weapon is SO effective against BOTH of Leo's swords. Karai <WHIPS> the chain <DOWN> toward Leonardo. On the empty railing as the razor chain <CRASHES> down <CUTTING> and <TEARING> the railing to pieces." Wow... is that a razor chain or a razor chain SAW? "*Karai falls to the ground, beaten and weak. She removes her Shredder helmet revealing just how frustrated and weak her face is." So... she's weak? Seriously, has she not been doing her endurance training? It seems like she's going strong and then just gives up. Leonardo <LANDS> <CROUCHING> in an open window frame. He faces Karai. CLOSER ON- Leonardo’s eyes narrow. Stay away from my family. Leonardo <LEAPS> out the window and into the dark. *ON- The statue of Oroku Saki. With almost a flash a <CUT> appears at the neckline. " What's up with this "almost a flash" business? Seems dopey. "The head of the statue <FALLS> off the body and hits the ground in front of Karai with a heavy <THUD>…"
The way this is written, it appears that Karai was sitting right next to the statue, which seems kind of odd. Why not have the severed statue head it the ground and ROLL several feet toward her?